I remember rare trips to the mall as a child when my parents would treat my brother and I to an Orange Julius. The frothy orange vanilla drink was heaven! Even now, when I would take my own children to the Dairy Queen / Orange Julius a half mile from the house, I would forgo the ice cream in favor of a freshly blended Orange Julius. 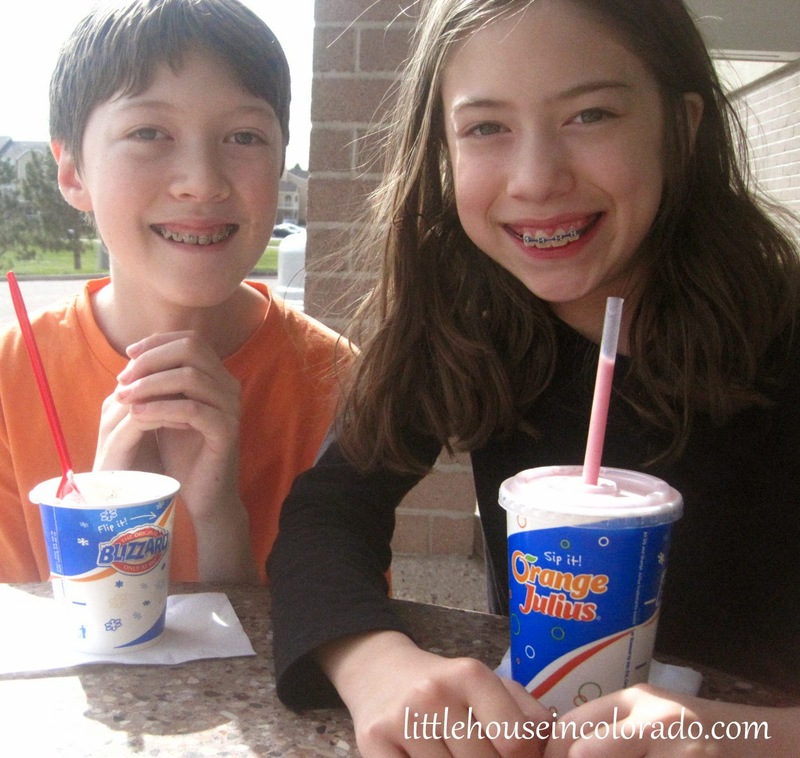 Mr. LH and I had tried various homemade Orange Julius recipes with some success. The recipes called for Dream Whip or vanilla pudding or powdered milk. They were good, but they weren't quite right. Other recipes called for egg white or egg white substitute (I guess to achieve the frothiness like egg nog?). I didn't want to fool around with eggs just for an Orange Julius. On a trip to Costco one day, we happened upon the VitaMix demonstration. The demonstrator was making mint chocolate chip ice cream...with spinach (Wow! It was fabulous!) but then she mentioned someone making Orange Julius at home (after all, Orange Julius uses VitaMix blenders, right?). Hello! Orange Julius? That got my attention! I requested the recipe. I have a VitaMix, passed down to me from my mom. In fact, I have two. Twice now, when my mom upgraded her VitaMix for whatever reason, I got the old (perfectly functional) one. The oldest one I have is all stainless steel and is about 24 years old. They're not pretty, but they were both free and they both work really well. With my new Orange Julius recipe in hand, I pulled out one of the blenders and made a drink. 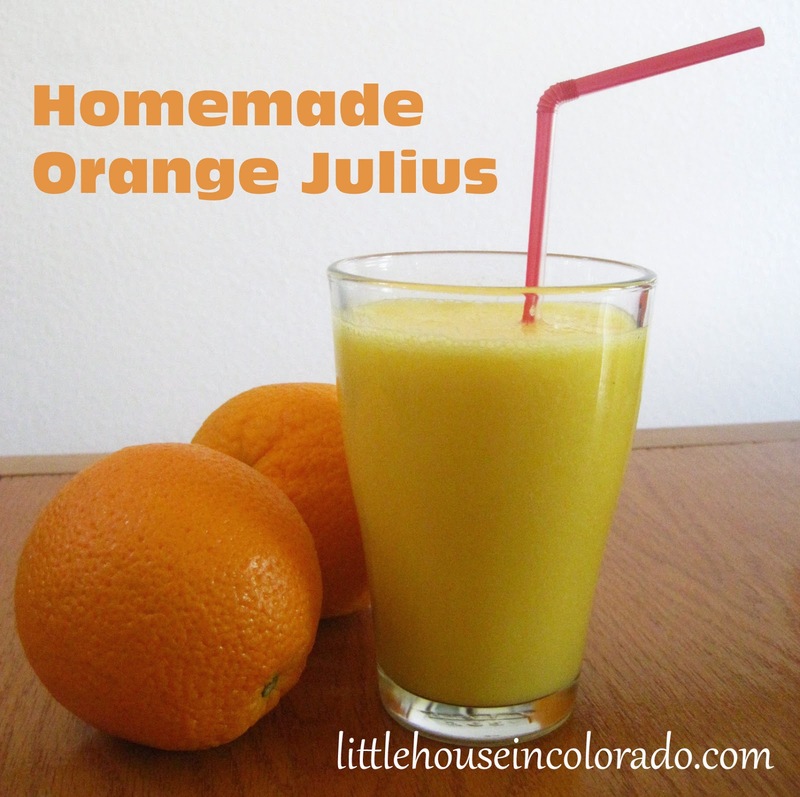 There are so few ingredients needed for this Orange Julius Recipe, you probably have them all in your kitchen right now! And it's so easy! Seriously! The hardest thing about this recipe is peeling the oranges (which, by the way, we got a case of oranges at Costco before we left)! It has become a Saturday morning ritual but it's so easy, we can make it whenever we want! Place ingredients into the VitaMix blender in order listed. Place lid on blender and blend on high until smooth, then on "variable" for one full minute. (On newer VitaMix models, I believe you would use the "smoothie" setting.) and that's it. Frothy, creamy, orang-y goodness achieved! - This serves 2. We double it for our family of four. - You can sub raw sugar, honey, agave, etc but it may alter the finished taste. You will also need to adjust the amount. If I have a batch of very ripe oranges, I cut back on the amount of sugar. - Although I have not tried it, the VitaMix demonstrator said you can sub coconut milk or almond milk for the half & half. - I have added a whole peeled banana to a doubled recipe. It was very good but since the banana was really ripe, it had a strong banana flavor. - You MAY need to use the tamper (that comes with the VitaMix) to get it started. - If the finished drink is too frothy for you, try running the blender on "high" for a bit. I've found the "variable" setting makes a frothier drink. I have not tried this in a non-VitaMix blender. If you try it, comment here to let everyone know how it worked out. School lunches have gotten to be really expensive. I remember being in elementary school and having to keep track of my 2 quarters so I could pay for lunch. That was back when our milk was paid for separately and my brother and I still took our lunch to school most days to save money. Now, school lunches cost $2.50 or more and doesn't offer nearly what the school lunches of yesteryear had. 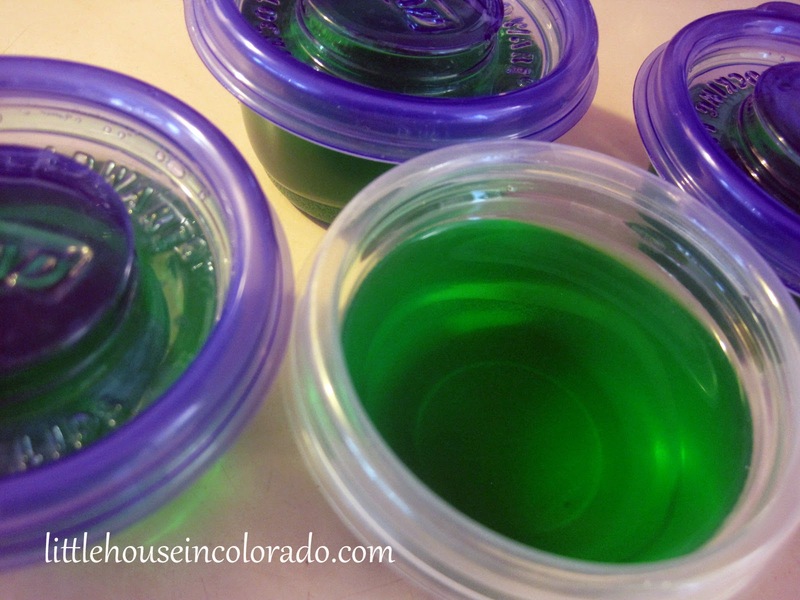 To keep costs down and the "Pickles" tummies full, I have started making my own snack cups that they can quickly grab and pack in their lunches. They can even have them as after school snacks. I got the idea awhile ago from someone who called them 100 calorie snack cups. I don't know if what I pack is over or under 100 calories, but it works. I use the small 1/2 cup (4oz) sized Gladware disposable containers. The "Pickles" are "trained" to bring the containers back home but if they forget or if it gets accidentally tossed in the trash can, it's not like it was expensive Tupperware. 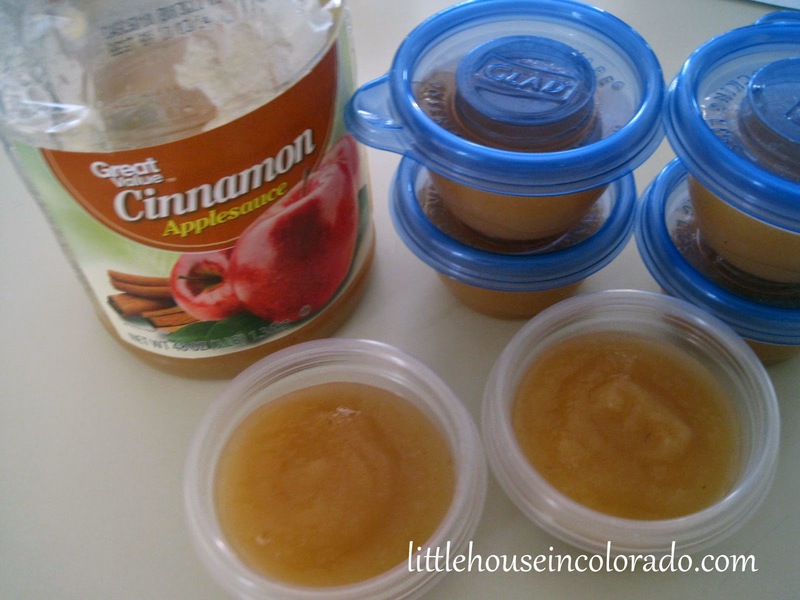 I pack all kinds of stuff into these containers (see the list of suggestions below). If the snacks need to stay cold, a small ice pack in their lunch box does the trick. It saves a ton of money over buying individually packaged snack-size stuff because you can buy a large package and portion it out into these smaller containers. You can even control portion sizes this way. If the "Pickles" want an afternoon snack, they get one of these instead of filling a bowl full. 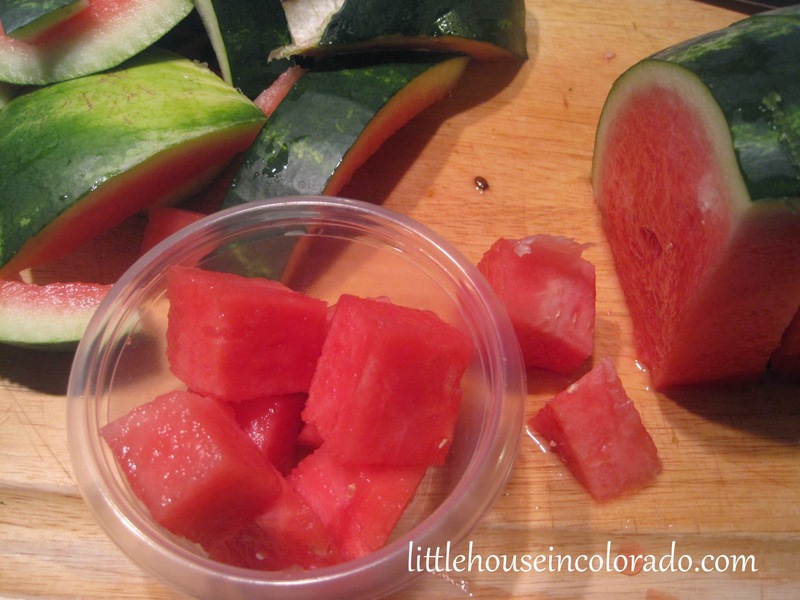 Fresh fruit - grapes, diced peaches, pears, apples, watermelon, etc. I usually make up a bunch of these over the weekend to be used throughout the following week. That way, they stay fresh and appetizing, especially if it is something that needs to remain refrigerated. Last November when my oldest son asked me what I wanted for Christmas, I immediately said "A shovel." If you were to ask Mr. LH what in the world I was thinking, he might tell you that trying to understand my motivations for anything would take a lifetime. But in this house, my request for an extremely practical gift is nothing new. Several years ago when unemployment forced us to move out of state (from a farmhouse on 3.5 acres to out little house in a suburban neighborhood on a tenth of an acre), we left a lot of our things behind...including ALL of our large gardening tools. We figured gardening tools could be purchased again as we needed them. We bought a rake when we discovered the house we were renting had horrible thatch problems in the yard. 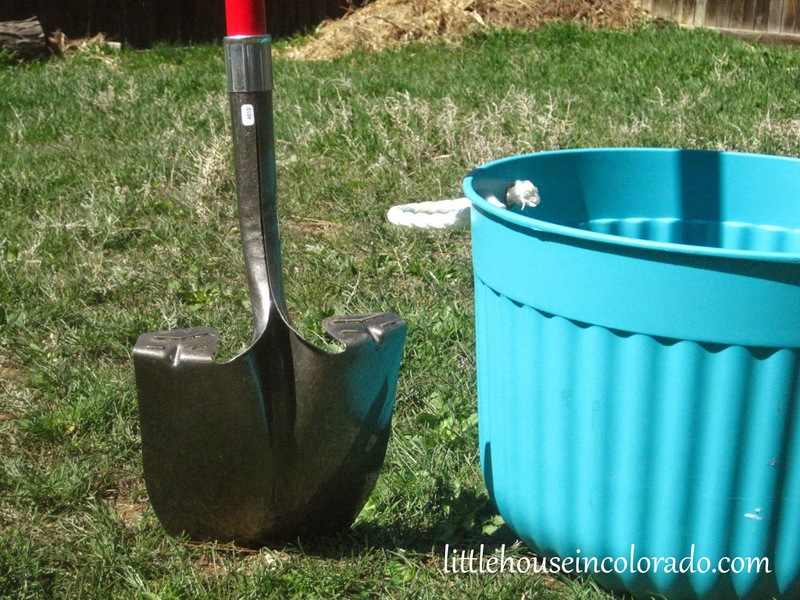 Then I asked for (and received) a pitchfork for Mother's Day when I started a compost pile for all the pine needles, leaves and grass clippings. But although I love to garden, I never bought a shovel. There was always something more important to spend the money on. So for three summers, I grew vegetables and perennials in containers and small beds using a hand trowel. When I announced to my son my Christmas wish of a shovel, it took him a minute to respond. All he could manage to say was "A shovel? No, seriously." I think he really thought I had been joking. So this past Christmas I got a couple of gift cards equaling what he and his fiancee thought a shovel might cost. I was quite grateful. I didn't immediately run out to buy my shovel. In fact, I put off buying one for a couple of months. I had to find a deal, right? I wound up getting my shovel right before the arrival of Spring. In fact, with the help of a hefty coupon and a sale at Ace Hardware, I bought two. A gardener can never have too many shovels, right? 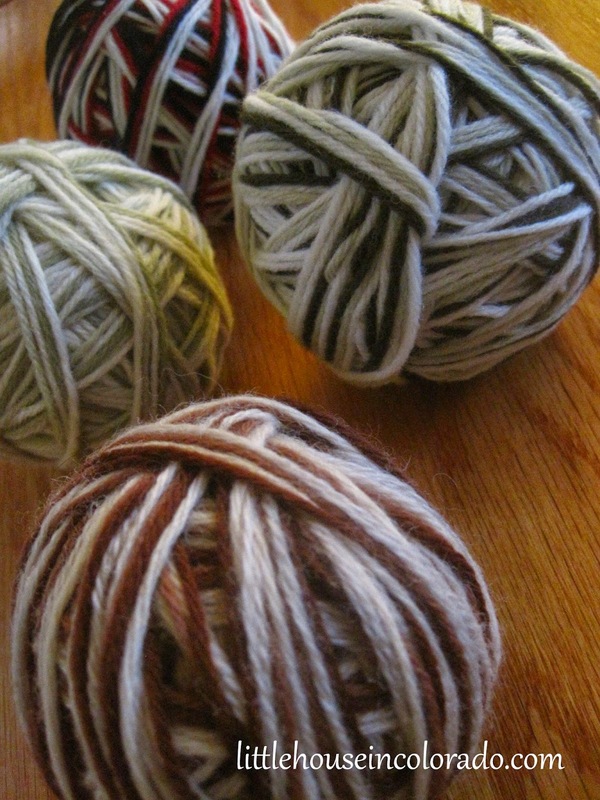 Wool dryer balls are said to cut down on drying time in the dryer. They bounce around with your laundry helping to separate it and improve air circulation. If you add a few drops of essential oil to them, they can scent your laundry like dryer sheets do. I couldn't believe how much wool dryer balls were going for ...$18...$30...no thank you! Especially when you can choose from one of the MANY tutorials all over the internet. I used the tutorial from These Light Footsteps. This is a very quick and easy project. My dryer balls were made and put into service within a few hours. 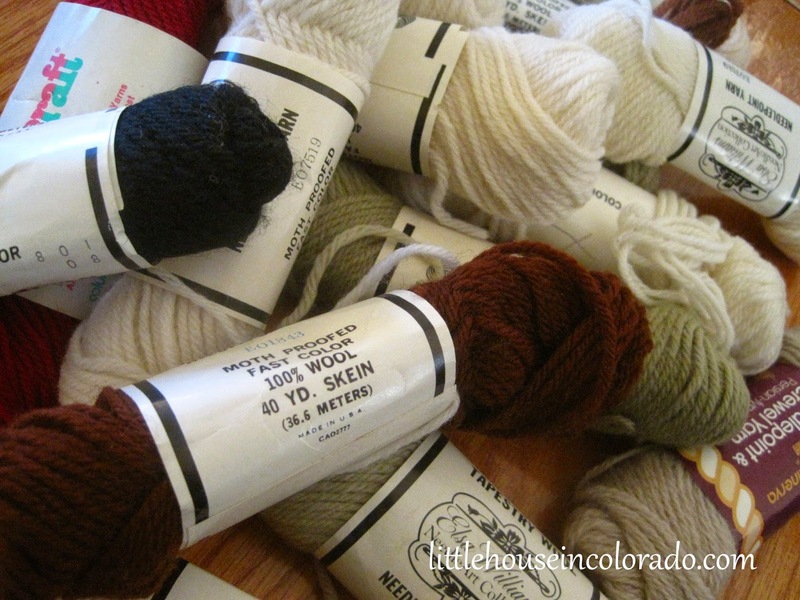 I picked up a bag bag of wool yarn at a thrift store for about $3. This was all labeled "Tapestry" and "Needlepoint" yarn but it was all 100% wool. 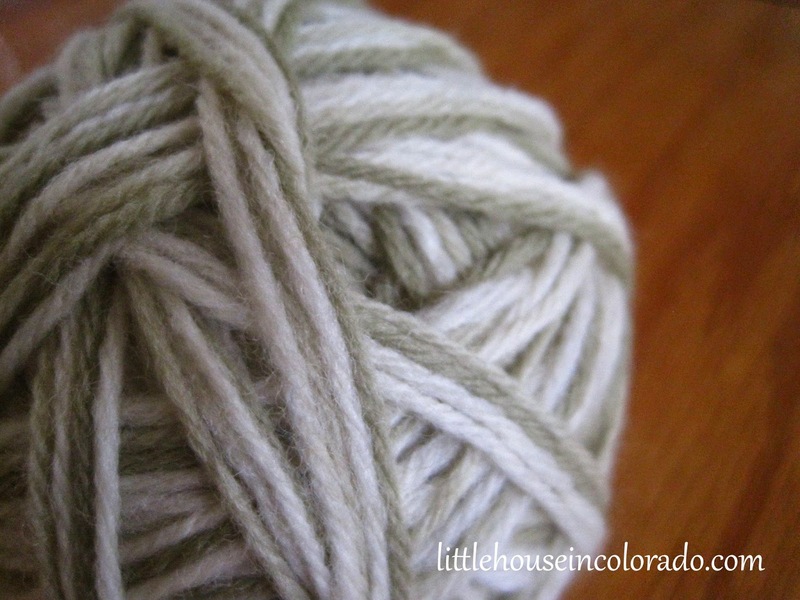 Since the yarn was thin, I mixed colors and put 4 strands together to wind my yarn balls. The end of the yarn was tucked into the ball. All of the yarn I bought made 4 balls. 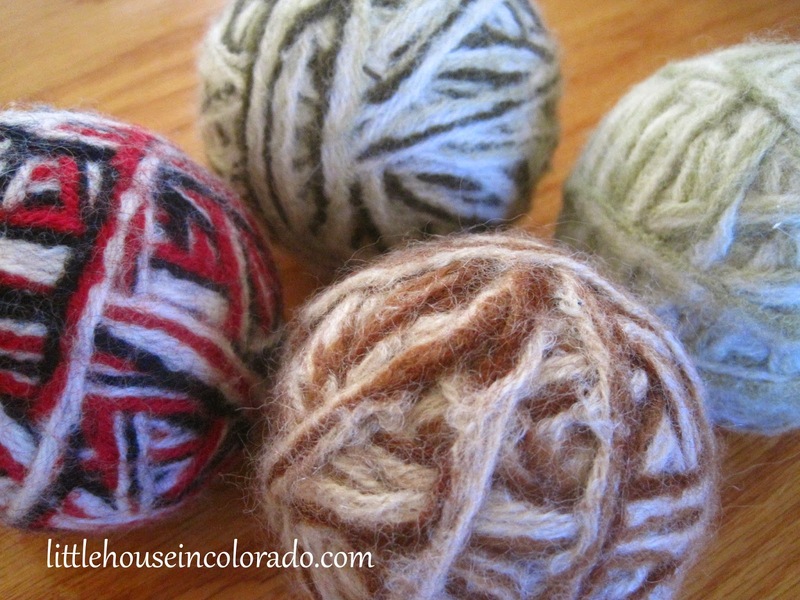 After running them through the hot dryer a couple times, I had felted wool dryer balls! For the initial drying period, the felted wool balls were put into old pantyhose with a knot tied in the hose between each ball. This kept the balls from felting to each other. 30+ laundry loads later and I haven't used a single dryer sheet. I have noticed the lighter loads of laundry drying a little faster but heavier loads (towels, denim, etc) don't seem to make much difference. 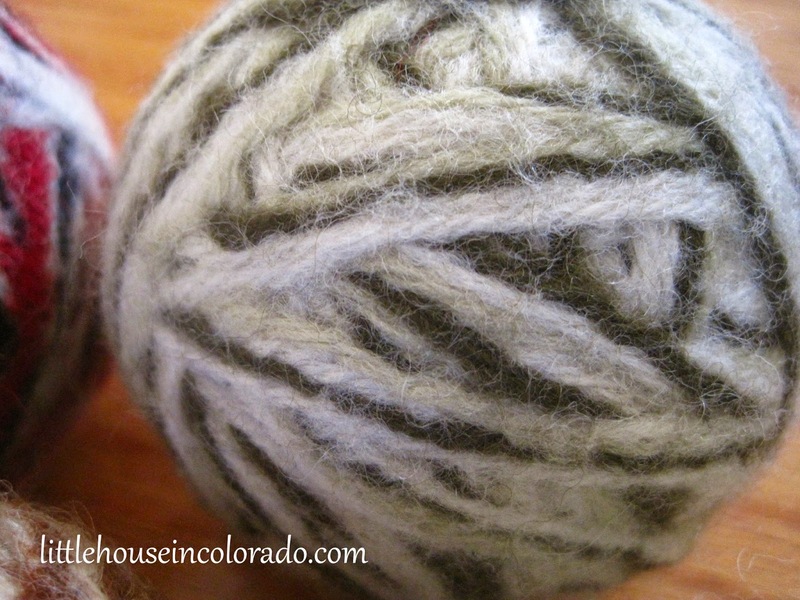 I think next time wool goes on sale, I'll pick some up and make some felted wool dryer balls to give as gifts.